Green Goodness is For Real! Many of you who know me personally have already heard me talk ad nauseum about our new household gadget, the Vitamix. I have to say that I was pleasantly surprised because after finally deciding to purchase one after talking about it for over a year, my husband and I thought for sure we would die from having to wait the prescribed 7-10 days for shipping. However I placed the order and within 3 days, the enormous Vitamix box was on my front porch! We’ve been happily juicing entire fruits all weekend and creating sugar-free sorbets and all that yumminess. But the big event for a Vitamix owner and for anyone who is into plant-based nutrition, is conquering The Green Smoothie. 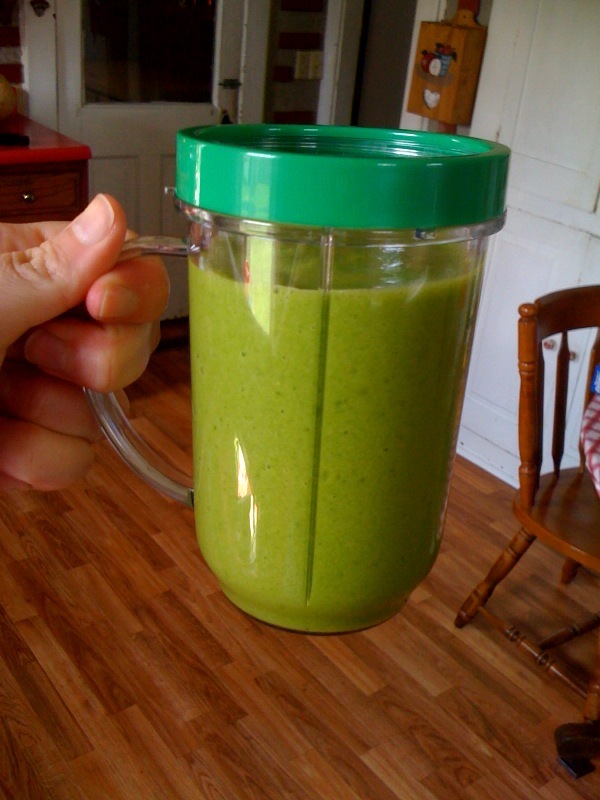 Enter The Green Smoothie. It allows you to combine these super-veggies that would normally not make such a delicious drink, with whole, natural fruits that do make delicious drinks. And the leafy greens literally get hidden inside the smoothie. Well, their color certainly doesn’t, but their taste definitely does. Today I created my first green smoothie, and I got the idea from another site (sorry, I can’t recall which one and there are a lot of sites with this particular concoction, so my apologies for not being able to credit the author on this one) and the person referred to it as an “Orange Creamsicle Green Smoothie.” You’ll know why when you taste it. 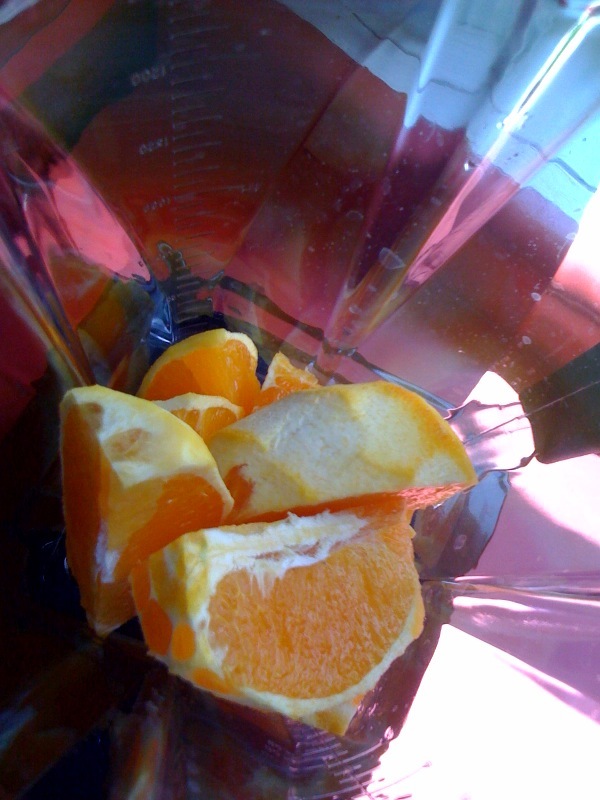 First I added 2 quartered navel oranges (these smelled awesome!) I had peeled the skin off but left the pith (the white part) because it contains nutrients and fiber that you’d normally miss eating the orange. The pith has a bitter taste, but when you blend it up in a Vitamix, you get the good stuff and you never know its there! 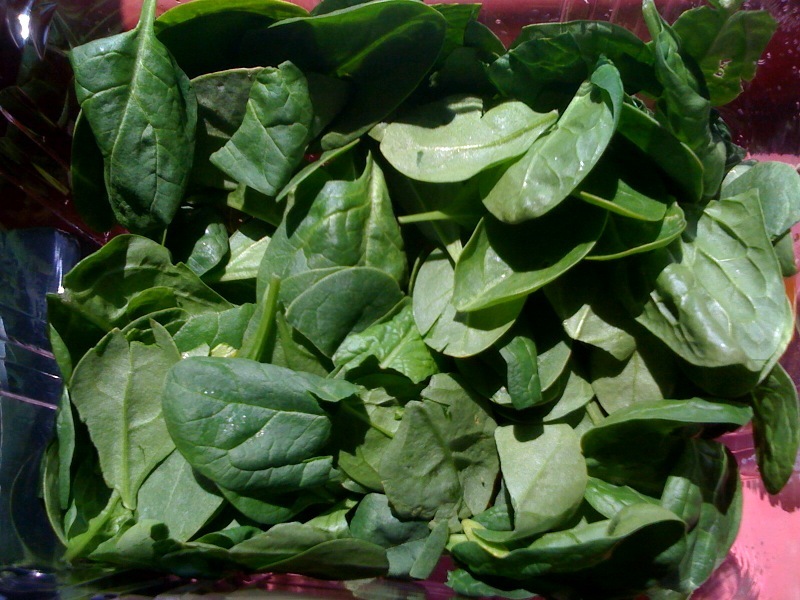 Then I added 2 giant handfuls of fresh organic spinach leaves (about 4 cups), 2 whole bananas (peeled) and about 3 cups of ice. The Vitamix shredded all this up in about 90 seconds like it was nothing! I was left with this emerald-green beauty…but would it taste like Popeye’s spinach or would I, as many before me have claimed, not even be able to taste the greens? WOW. Turns out that the claims were true. I took a big sip, half expecting to want to spit it out, but found myself enjoying the creamy orange-banana flavor of this mysterious Green Smoothie. I cannot wait for Todd to get home so he can become a convert too. I’m even taking some of the smoothie to book club tonight so the gals can sample its wonderfulness. I just drank my salad and several servings of fresh fruit, people! And I LOVED it!